When we went to Peppa Pig World on Thursday and to keep Amy entertained while waiting in the queue, we visited the penguins. She absolutely loved them and got rather protective over the big penguin when some teenagers walked towards her – she looks like a little activist, haha! What I really love about this photos however is that it reminds me of a picture that my dad took when I was little. It shows me next to a huge bin that is shaped like a penguin and I absolutely loved them when I was little. 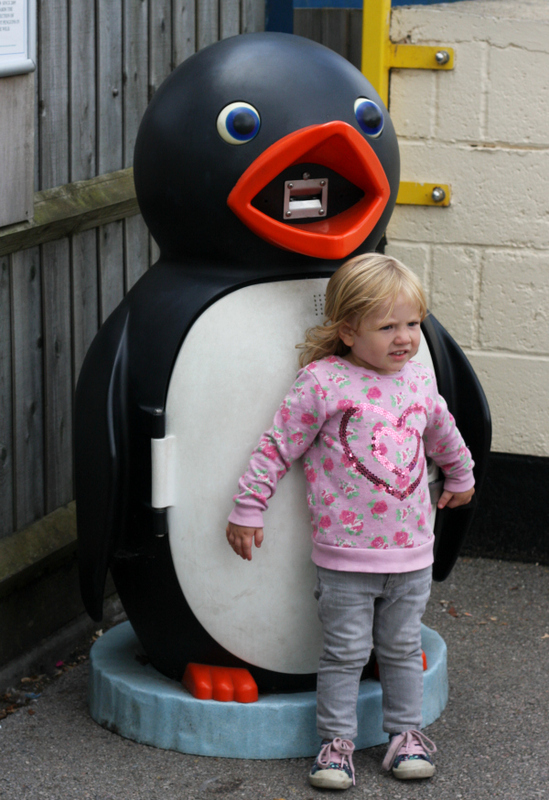 They bins were a feature at our local beach and seeing Amy with this penguin reminds me of my own childhood – I will try and dig my photo out for you! Now it’s your turn, what is Amy thinking or saying. 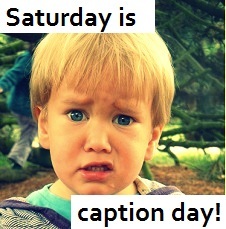 Leave me a caption and then hop over to Annie’s blog for more fun pics from the last week! If you want to get to him, you have to go through me first! I cant believe Pingu is bigger than me! Daddy penguin was surprised at how this egg had hatched! Buzz off that’s my penguin (taken & adapted from Room on a Broom). Just try to look plastic and I’ll get you out of here! I’m not leaving unless he’s coming with me! I’m holding this penguin hostage! Take me, bit don’t take the penguin!! Mess with this penguin and you’re messing with me too! Careful, this mouth does not fire blanks! Aww, she looks so cute protecting the Penguin, hehe!